Published by Dutton Adult, 2011. For the d-n-d, read Chuck Crane's review on Amazon (no sense in restating it all here). Chuck does a more than adequate job of outlining as you'll see. My interest in the book is self serving of course as the idea's presented sync with mine nicely. I heard Mr. Cowen interviewed on NPR and what he said not only made sense, but also added perspective to my own similar ideas. I have his most recent book Average Is Over on order. Listed below are 5 key points from the book as outlined by Chuck Crane in his review. The economic low hanging fruit that has historically propelled growth and prosperity in the US, is drying up. Examples include: free land, technological breakthroughs (big ones - electricity, motor vehicles, radio, telephone, computers, etc. ), public education, cheap fossil fuels, and so on. Other countries are experiencing "catch-up growth" including India and China, where technological innovations in the West have been leveraged and leap-frogged, resulting in a sudden flattening of the playing field. Median income growth has slowed since the early '70s, something I have written about frequently. I am amazed how little scrutiny this gets in the media. I guess the slow boiled frog analogy fits here. The rate of technical innovation has slowed, since 1873 and most notably since 1955. Recent and current innovation is geared more to private goods than to public goods, leading to an increase in economic inequality. Books like this naturally interest other economists. But what about those noodling social issues? Furthermore, what about those in the greater workforce field, from high school guidance counselors to headhunters and WIA implementers? And yet, as big as the workforce field is, it's not big enough. What about lawmakers and real social policy movers-n-shakers? 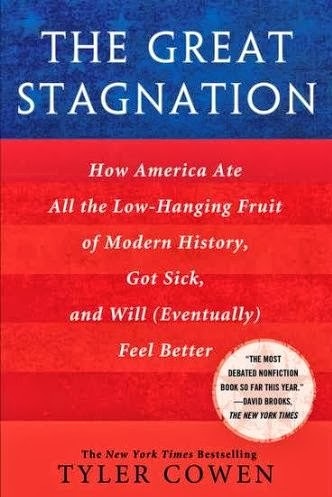 If Tyler Cowen is correct and the US has hit a plateau (and stagnation will continue) what are we doing about it? From my perspective, next to nothing. I hate to say it as much as I hate to see it. The current super-gridlock in Washington DC is proof in the pudding. For the time being (and it may be a very long time being at that) government is shackled. As Cowen notes, one party can't come up with a real plan to address the budget deficit (driven in no small part by Social Security and Medicare) and the other party can't stop pounding the tom tom that tax cuts (the apparent answer to everything) will increase revenue and pull us out of the muck. Cowen's ideas add to my contention that this is the era of the Free Agent worker. And again, by worker I mean nearly everyone other than those not needing to generate income (those enjoying inheritances, the truly retired, and passive owners). That leaves 90%+ of the population as WORKERS in one form or another. When it comes to finding a job, advancing in a job, moving to a better job, being a Free Agent means it's all about you - not I hope in a narcissistic and selfish manner, but rather in a heads-up way. In order to achieve your career and life objectives, you must see things as they actually are - that you are a Free Agent. And the younger you are, the more important the acceptance of this concept becomes. Tyler Cowen knows this and I hope he makes it a point to pass it along to his students at George Mason. The question is, do you know it? First of all let me say that I liked the book. The Subversive Job Search is an autobiographical account of author Alan Corey’s quest to land a six figure job. It's a quick read, written in first person, and a nice switch-up from so many other (and drier) offerings in the job search and career field. But job searching, as a cut and dried category, is not the singular focus of the book. Rather it’s about how Alan goes about the process of searching and achieving his goal. He portrays himself as an entrepreneurial, outside-the-box, thinker-mover type. This seems to fit. Although there’s a fare amount of I, I, me, me that can make reading autobiographies such a chore, Alan’s approach feels genuine. Sprinkled throughout are numerous self effacing and humorous comments. Add to this an every-day casual tone and the result is a fun and realistic read. It works. From there, job searching enters the picture. Alan gets down to business, tussling with the nitty-gritty of managing and adapting to the ebb and flow of the process. Readers will find interesting and useful discussions on free certificate Vs formal education, working with recruiters, personal branding, and the merits of taking on a free agent mindset. Furthermore, Alan includes resources and links that complement his overall philosophy and approach. This work will immediately appeal to career oriented, college educated, 22-45 year old job seekers, particularly those targeting positions in tech sales and support. This is the field of play for Alan’s challenge to himself. Anyone working their way up the ladder in these areas will enjoy the book and get something from it. But there’s a job search back story here as well. It involves the how and why of Alan’s approach. I have not met Alan nor have I read his first book but I can imagine him to be the Type-A, goal oriented, hard charging achiever that he describes. As such he pretty much had to do and discover for himself; to find out for example, that resume bombing has a poor ROI or that jack-of-all-trades usually doesn't pay. With a little research these job search 101 lessons could have been avoided. 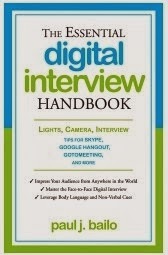 But then they and other job search / career advancement situations would not have been included in the book. Individuals struggling with the same issues, as well as those of us interested in the how-to of job search, wouldn't have the benefit of Alan's unique perspective. Outside-the-box thinkers have to go about things their own way. Alan made job search and advancement into a game. He constructed an approach that suited his goal oriented, self-directed, entrepreneurial style. Others going through life with similar personality default settings can learn a great deal from how he did it. For this group especially, The Subversive Job Search should be required reading.